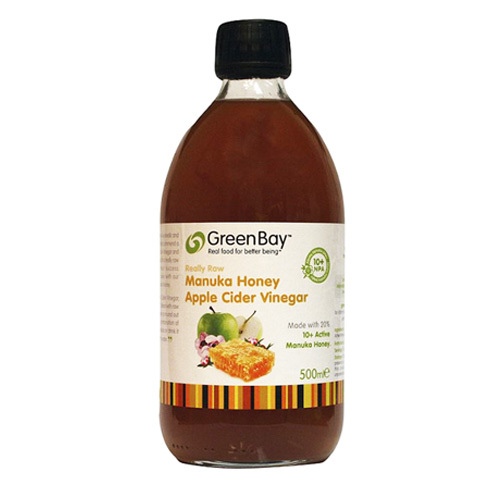 Green Bay Manuka Honey Apple Cider Vinegar may help maintain a healthy circulatory system. Manuka Honey’s anti-inflammatory properties may help soothe sore throats and reduce the urge to cough. Manuka Honey Apple Cider Vinegar may be particularly useful in aiding weight loss. Apple cider vinegar may help with detox support and emulsify fats to speed up the body’s metabolism. In addition Manuka Honey contains Iron, Zinc and B vitamins, which may help the body absorb important minerals such as calcium and magnesium from our food. Apple cider vinegar contains 18 minerals including potassium, which can help remove excess fluid and toxicity from the body’s cells. The combination of apple cider vinegar and Manuka Honey is highly prized, and may be beneficial for digestive health. This delicious blend also provides good levels of beta carotene which may help fight the free radicals associated with many degenerative conditions. Manuka Honey is made by bees from the nectar produced by the Manuka bush (Leptospermum Scoparium), a relative of the tea tree, which grows exclusively in New Zealand. This refers to the antibacterial activity in honey. The Manuka bush has antibacterial properties which are also found in the honey produced from the bush: the strength of this activity can be measured by comparing its capacity to fight bacteria with that of a standard antibacterial agent, such as phenol. Is Manuka runny or set? Green Bay honey is thick and runny: however, if it starts to set and you prefer it runny, you can reheat it gently without damaging its nutrients or antibacterial properties (see above). Can I put it on cuts? Manuka honey can be used for treating minor wounds, cuts and grazes. Spreading the honey on a waterproof dressing is a good way to apply it: the dressing should be changed at least daily. The antibacterial properties are so effective that honey is used in hospital treatments: it also helps to replenish healthy tissue at the site of a wound. Organic Apple Cider Vinegar (75%), 10+ Active Manuka Honey (20%), Clover Honey (5%). Below are reviews of Green Bay Manuka Honey Apple Cider Vinegar - 500ml by bodykind customers. If you have tried this product we'd love to hear what you think so please leave a review. Excellent thirst quenching drink, nice sharp taste, which I like. Green Bay Manuka Honey Apple Cider Vinegar may help maintain a healthy circulatory system. Manuka Honey’s anti-inflammatory properties help soothe sore throats and reduce the urge to cough.